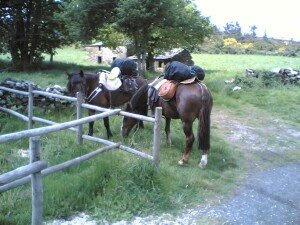 The Camino can be completed either on foot, with a bicycle, or on horseback. According to the Pilgrim Office's May 2006 statistics, 56 people have done it on horseback. I've walk for most of the camino without seeing anyone on horseback even though I have seen horseshoe tracks along the path in the camino. 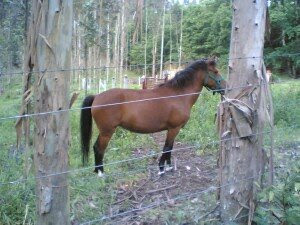 Finally in Galicia, I saw these two horses that looked like they could be pereheeeenos! No humans in sight. They are probably having their lunch at the farmhouse behind. 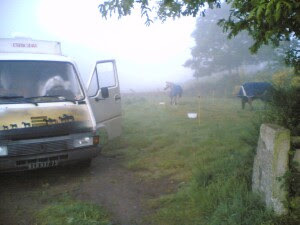 The next morning, I found them, sleeping in the van. Uhmm.. the humans, not the horses as you can see below. 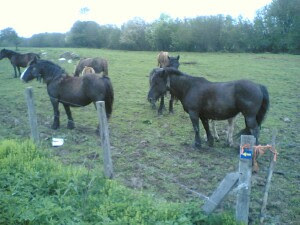 They told me these horses needed to be groom regularly, and on average only gives 35 km per day. Ha! That's not much more than a day's walk for a pilgrim. Three days before arriving to Santiago, I suffered from a huge pain in my ankle which I believe to be tendonlitis. I met this horse here who is extremely friendly. She walked with me along the wire barrier and sticks her head out many times for me to pat her. It looks as if she can feel my pain, and wanted to console me. I am so touched. If I hadn't grow up in a city, I would probably be working with horses. Such majestic creatures.